If you opted to save $30-$45 (depending on your cable provider) on Saturday by not buying Bellator 120 on pay-per-view, you missed a straight up robbery – that is, if you were to ask Muhammed “King Mo” Lawal. 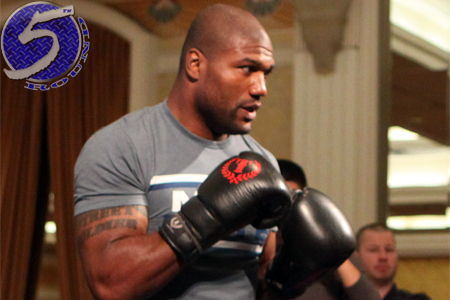 Lawal thought he had done enough to beat former UFC champion Quinton “Rampage” Jackson (pictured) in the finals of Bellator’s Light Heavyweight Tournament and advance to a title scrap against champ Emanuel Newton, but the three officials sitting cageside saw things differently. When the dust settled on their shootout, Rampage walked away with a (29-28, 29-28, 29-28) unanimous decision victory. Lawal had some choice words for Bellator CEO Bejorn Rebney after his disappointing loss. Unfortunately, his post-fight speech was not captured in the video below. Landers Center in Southaven, Mississippi hosted Saturday’s festivities.